Each day we are amongst many different shapes, which come in a variety of sizes and colors. Rarely do we even notice how every factor in our life has a shape and belongs in the category of shapes. From the furniture we choose to the decor we hang on our walls we are emotionally connecting with the shapes. The architecture of a structure comes to existence through shapes. These lines, curves, squiggles are all around us shaping us every day. The building blocks and foundation of design is to clearly state visually. This means the visual effect is the personality of a given space. Shapes have an impact in ways that colors cannot. Not all shapes have boarders or are confined. Some are free –form blobs that are flowing. They come in come in all sizes and are not limited to being simple. Whereas, complex shapes derive from a combination of simple ones. Attributes of shapes are both positive and negative. They can also be attributed to being masculine and feminine. Yet are a neutral in part. Every shape communicates meaning and conveys emotion. These figures set the mood. Furniture and décor are shapes that fill a room. Our eyes present shapes that translate to feelings in our minds. Movement, texture, depth is produced by shapes, lines, curves, etc. Direct points of interest are enhanced and/or achieved by the “shape” in the given area. 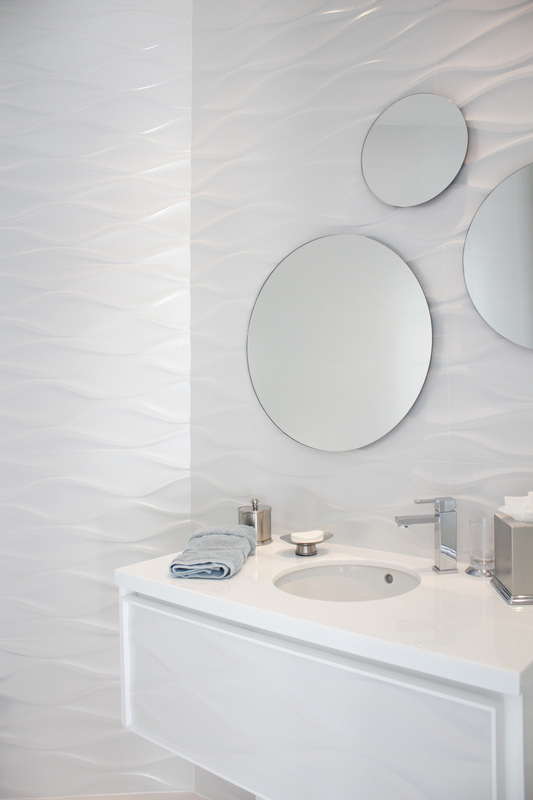 Squared with straight lines and edges produce a stabilizing effect to design. Hence, a feeling of home. The square is sturdy and stable. However, sometimes the opposite may be true as the straight lines could be viewed as harsh and too bold. The four lines connecting at ninety degree angles make it one of a kind. The square represents the four elements: fire, earth, water, and air. On the other hand when dealing with feng shui squares are part of the wood element. The circle has neither beginning nor an ending. It is round and promotes movement. A representation of a cycle, unity, a safety, a community, and a wholeness that is familiar. A round a round we go into a place of oneness, with boundaries. It denotes a separation with the solitude of peace. Two symbols that are signified in a circle are the peace sign and Yin Yang. In addition, the Yin Yang represents two opposites coexisting within one confined circle of peace. According to Feng Shui, “round” is an expression of the mental element. It conveys energy of clarity and freshness. Another example to refer to is the “Round Table”. Many designers and corporations suggest using round tables as it generates equality to the table and the members or people who be sitting around the table. Using this same theory interior designers do their best to create a circular seating arrangement when placing the furniture in living rooms as well as family rooms. This strategy promotes communication and insinuates equal conversation. The triangle is a shape with many meanings that can be interpreted. The direction pointer of all the shapes. It’s strong when standing on its base pointing upward vertically showing an active Yang energy. When the point of the triangle is pointing downward, it has more of a passive Yin energy. No matter what the direction, the triangle is a set of three coming together at a point that corresponds to dynamic action. When applied with feng shui triangular shapes belong to the fire element. One way of applying feng shui with use of a triangular shape is through light fixtures that are shaped like stars. Free of form and restriction creative “blobs” or unconventional straight lines in combination with curved ones are shapes that are abstract. These unique designs are flowing unraveling waves of adventure. They promote creativity and individuality. In addition they are the language to the vision giving communication without words. Abstract shapes such as curves are very fluid. Using them in your home signifies a water element which is graceful and flowing. Now you’re in “shape” with a few “matters of facts” on the visual communication of design. Gold is always in close relation to the sun that shines above us, giving meaning that represent: success, warmth, happiness, attainment, close truthful friendships, and prosperity. Overall, the color brightens all things and has a character that is optimistic. Divinity has also been connected with the color Gold. Regal in genre, gold is perceived as the color of and the credibility of financial well-being. Not only a symbol of riches and lavishness, gold is also represented as the highest monumental achievement award; i.e. gold mental. Gold is a variety of orange, yellow, and brown tones blended together to give the color its elemental appearance. Tutankhamun’s mask was made of gold. Gold was also first recorded as a word to describe the color in 1400 in the English language. The Crayola crayon color gold was first introduced in 1958. A symbol of monarchy for the British Empire would be the golden lions. Byzantine art often used metallic gold. Throughout history, Gold (Au) has been the element that is the standard of all value pertaining to monetary currencies. The standard economic unit of an account was measured by the weight in gold and is the only standard monetary system or policy as it is always measured in weight which is fixed. The Golden Age also known as the Utopian Lifestyle was a past era in which the highest quality of artwork would be produced. According to the American Society of Civil Engineers; The Golden Gate Bridge is considered and cited as one of the Seven Wonders of the Modern World. California was also considered the Golden State as it was best known for the Gold Rush that began in 1849. 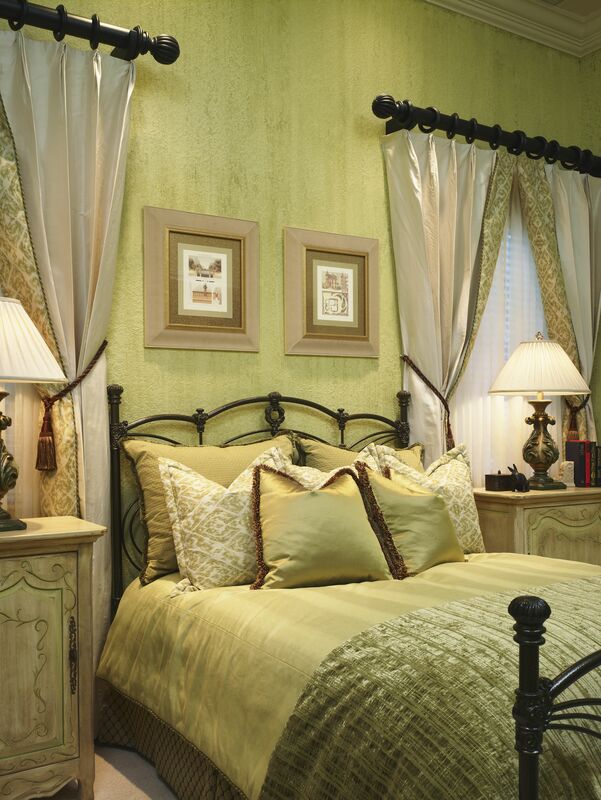 When it comes to décor, Gold has been the color of choice by many royalties. However the most famous known for the usage of the color gold would be the bedchamber of the Queen in the Versailles Palace. The main reception or ceremonial hall as well as the throne were called the “Chrysotriklinos” which translated means Golden Reception Hall. The bedchamber of the grand apartment in Versailles Palace is also decorated and themed in gold, this would also be the room in which the wife of King Louis XVI of France slept, Marie Antoinette. Gold is unique in décor as it truly does conform and match any other color in a palette. No matter what the trend or color scheme is of your décor, gold adds accent and grace with a touch of sparkle and glamour. 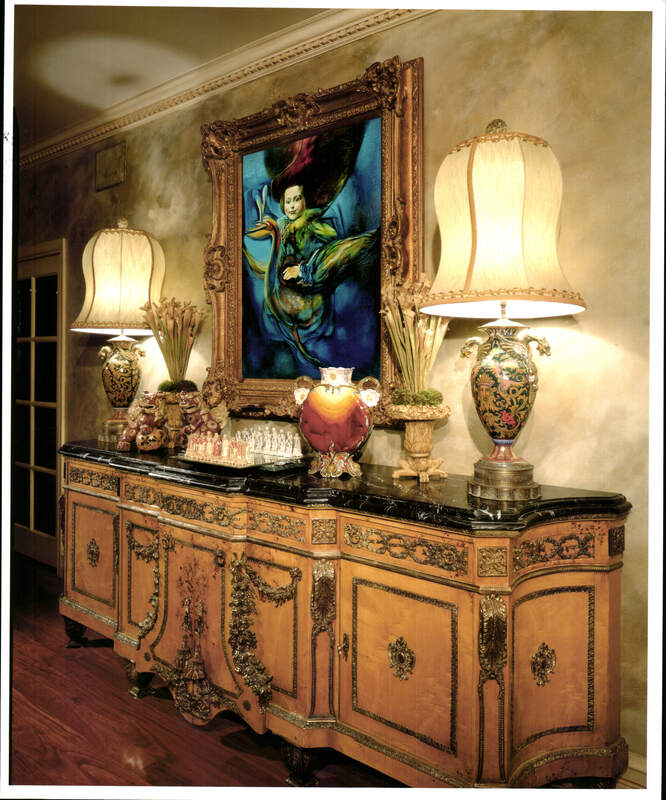 The color also can be related or considered an earth tone as it is a blend of the earth tones. 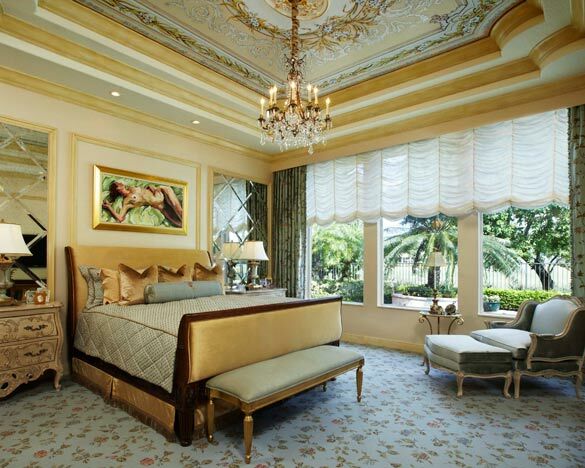 Another special attribute about gold is that it looks great in any and all rooms. It is not limited by a destination or space, but rather universally appealing for all spaces. It doesn’t matter if it’s a wall of a hallway, a bedroom, a bathroom, or kitchen, the color gold embraces the beauty, enhancing a variety of rooms in your home. The extravagance that leads by gold will shine in all tones, leaving you feeling that you’ve got the pot of gold in your home and have found the gold mine. In conclusion we give the color gold a ‘gold star’!! Interior design uses green often as it is the color that surrounds us most when we are outside or with nature. This common familiarity to the color makes it the perfect backdrop or theme to be used inside the home as it stimulates protective energies. It has been said that when asked what someone’s favorite color is green is second in the response; blue has been noted to be the first favorite color. The apparel industry has a superstition in relation to the color green; which is, it brings bad luck to the designers or design house if used and sewed with on the eve of a fashion show. The history of the word green derives from the Latin word “viridis” which means green or to grow. The word also comes from the Old English words grene or groeni. Circa 700AD the term was recorded as the word for the color term. Lust and love have also been known to represent this color in Medieval times. Green is not a primary color according to the primary colors however it is considered to be an additive primary color. Green is evoked by light and perception in the subtractive color system. The association with the color is due to its close relation to nature and chlorophyll that gives plants the green color. Green is a refreshing balance of the cool blue and warm yellow. This has a tranquil and refreshing effect on the emotions. Environmentalism is represented by the color green and has become the symbol because of its association with nature, health and growth. Sprouting recently in the past ten years has been the environmental “green party” which is in relation to more environmentally friendly products and usage of things. The commonly known phrase to describe a person who is gifted in growing plants is “Green thumb”. Vegetables that are green are known usually having high nutritional value. The color itself has many meanings, some of which are contradictory to each other. Symbolism meaning: harmony, freshness, fertility, growth, knowledge, safety, medical products, healing, ambition, relaxation, hope, stability, etc. This is a leading reason as to why many hospitals contain green walls. Green also has meaning to the lights in which direct the traffic flow, announcing “to go” when green. However, globally this color is the universal meaning of safety. Green on the contrary to the positive meanings or symbolism above has been also identified with: jealousy, greed, sickness, cowardice, discord, and jealousy. The spectrum visible to the human eye has green as the most occupied space, and has been known to enhance or improve one’s vision. Night vision goggles uses the color green as it the eye is most responsive to the color and able to detect variety of shades or hues of green. The color also is very persuasive in the natural world. Green physically effect has been known to assist in the healing of depression. The Heart Chakra or Anahata is represented by the color green and promotes openness allowing a person to love more, have compassion, and empathize. The traditional color of hunters as it camouflages them into the nature. Countries and Civilizations have been known for the different meanings that they believe Green represents. The Aztec culture, believed green to be royal. In Ireland it represents the “emerald Isle” and is known for the color especially on St. Patrick’s Day. In Japan, the color represents eternal life. As the color of hope, Portugal considers it to represent the season spring. China considers it to be beauty virtue as it is the color of Jade. Green represents the color of honor when apparel is worn in Scotland. According to Islamist ideology green is the traditional color and presently represents Islam in the flags of: Mauritania, Pakistan, Afghanistan, and Iran. Many religions connect the color closely to resurrection and regeneration. There are ONE HUNDRED AND THIRTY THREE countries that have the color Green in their flag. America’s first president George Washington’s favorite color was actually green. As the tallest living thing known the tree brings relation to Judo as the color green represents the highest belt attained. In auto racing a green flag is waved to start or continuation of a race. Many brands and companies have used this color as the signature or main theme in their logo. To name a few: Kermit the frog, Heineken, Starbucks, Rolling Rock, John Deere, The Masters Golf Tournament, and Garnier Fructis. The temperament of green really is significant when using it as the environment of designing the interior in a home. These interiors bring the outdoors inside with floor to ceiling windows. One look at these amazing interiors and you can see how the best of the outside is used as art on the inside. By using floor to ceiling windows it gives the room or space a grander feel as well as allows natural sun light to come in which improves by giving the illusion of a larger scaled space. 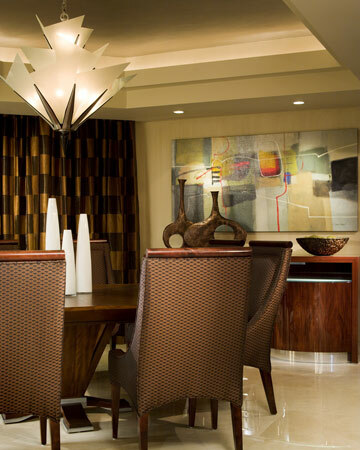 Horizontal and vertical lines depict the masculine line of this elegant dining room. The ice-cold floors and accent pieces are joined with the natural warmth of the beauty of the trees both inside and out. By combining these diverse elements, one can create incredible force and allow the viewer to imagine the room as they want to see it. The natural beauty of the outside, combined with man created beauty of the inside, frame a perfect picture and present a victory for the designer and an incredible dining room for the home owner. It is the classic example of designing for the view and natural elements. This room is illuminated by the elongated windows and enhanced by the white walls and floors. 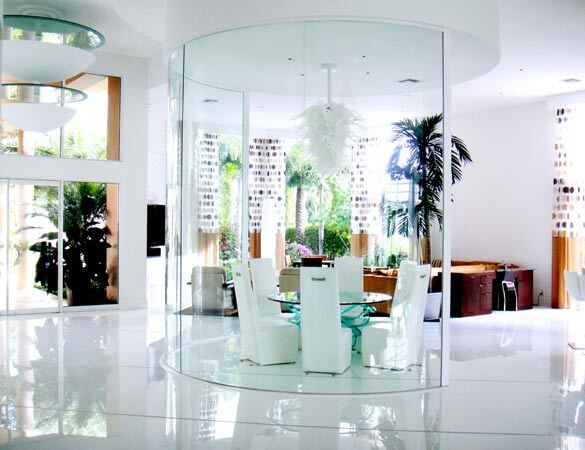 The natural light makes this white boxed room shine with a pure and natural reflection. Please note how the designer has elected to highlight the draperies rather than try to have them drop and disappear. By bringing you to the power of the window treatments, the occupant and or viewer has no choice but to be enthralled by the natural beauty of the outside elements. The room smells of both warmth and excitement, as the outside hypnotize us to the tranquility, but at night the excitement of the enclosure can show off the boldness of the design. A great example of how you can design for day and night. The drapery used gives geometric shape to the décor. By using the circles or dots on the window treatments it becomes a visual delight. Another usage of these blinds was to give an optical illusion of the height and pronounced tones of highlighted design. True design is the ability to orient the room so that the line of sight of the inhabitants is always directed as the designer has viewed the room in their creative stage. Here you have a square box of a room that is clearly directed to the natural beauty of the outside. 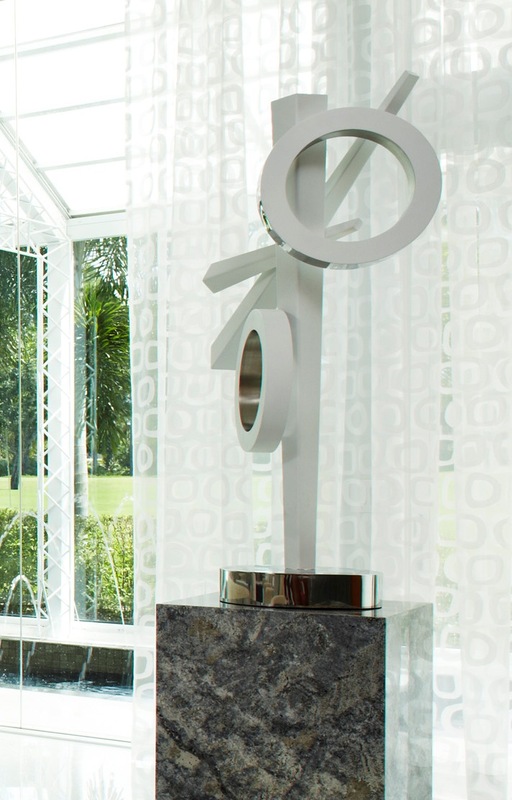 Notice the careful placement of the sculpture and light fixture to quickly grab you attention and slowly lead you to the peaceful setting outside. The perfect room, for the owners or guests to relax in, and enjoy Florida’s beauty. The sky blue carpet brings the blue skies inside and the floors the color of clouds. It is as if you are walking on air and dreaming on clouds. Ambient light is accomplished by using the clear glass panes with no film or tint to reflect interior light at a more powerful level. By hanging the whimsical drapes above the window sills adds length and illusion of the size of the windows, adding strength to the room. Overall the usage of floor to ceiling windows makes any room seem larger and more spacious. The perspective to the eye creates the feeling and physical reaction of enhanced space. These windows really are like a well-tailored article of clothing, they fit just right as well as enhance whatever space they occupy. Flooring is a very important element in the décor of your home. Most do not realize the value it has and how it really is the foundation of a residence. 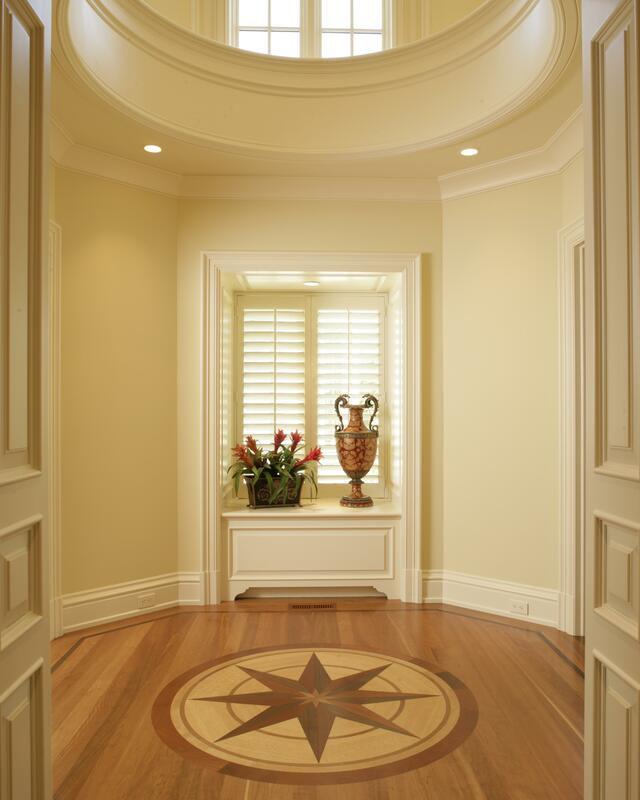 Floors add personality to your house; they deliver you from room to room and are what the walls are built from. This multi-talented surface serves as a dual acting foundation both structurally and decoratively speaking. The floors are a ‘statement’ when an individual steps in through your doors. Another words, they can either “work for you or against you”. With this in mind it’s no wonder people say, “I’m floored”. Mosaics date back over 4,000 years in history. Using different colored stones, shells, glass, pottery, and or other materials this technique of patterns through placement is still a decorative delight. The actual term for the individual pieces used is: Tessera or tesserae. The spaces between or the grout is called: interstices. Dating in the second half of the third millennium BC, is the temple in Arbra, Mesopotamia which contained the earliest known place where mosaics were made of different materials: ivory and shells. The first glass tiles making a mosaic was from around 1500 BC. The late 4th century Christian Churches began to have the interiors and exteriors full of mosaics from the walls to the ceilings. The Santa Constanza and Santa Pudenziana are from the 4th century and still exist presently. The Church of Nativity in Bethlehem floor is partly the original mosaics with influence of Roman geometric motifs. A coastal Ionian town of Sarada, Albania is where in 2003 the remains of an early synagogue had been found, the excavation was a huge find in history as it was the first time that archeologist were actually able to explore and do research on the site. Due to the Communist rule prevented it in previous years. Discovered were mosaics of a menorah, citron tree, ram’s horn, and other biblical symbols; depicting the Jewish holidays. The researchers believe that this synagogue was actually last used as a Church in the 6th century. Girih are intricate patterned mosaics, it’s most known as architectural art in many Muslim cultures. There are three main methods of mosaics, they are: direct method, indirect method, and the double indirect method. In addition to this, there are different styles or techniques of mosaics: Opus reglatum, opus vermiculatum, opus musivum, opus tessellatum, opus palladianum, opus classicum, opus circumatcum, opus sectile, and micromosaic. Opus origin is Latin and when translated to English it means “work”. 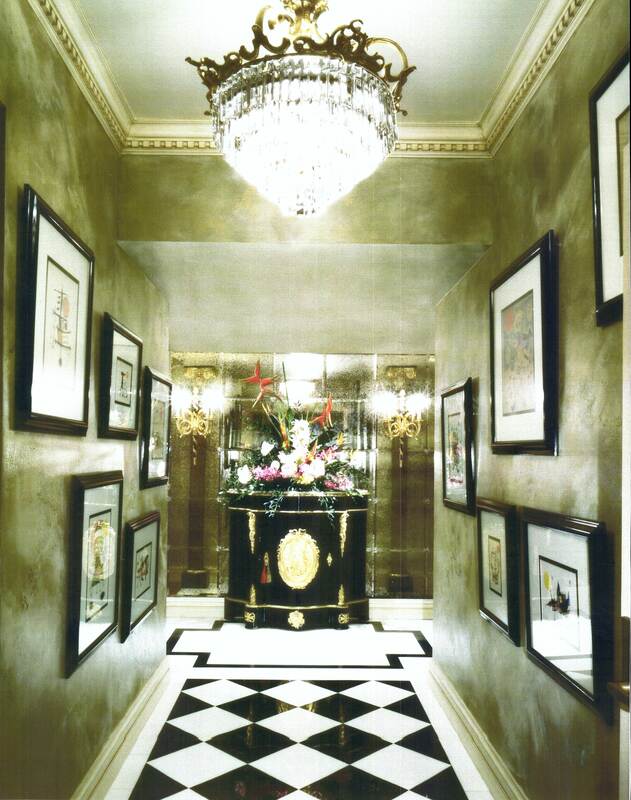 As you can see in the pictures, these floors are considered Mosaics however each one is made of different materials. 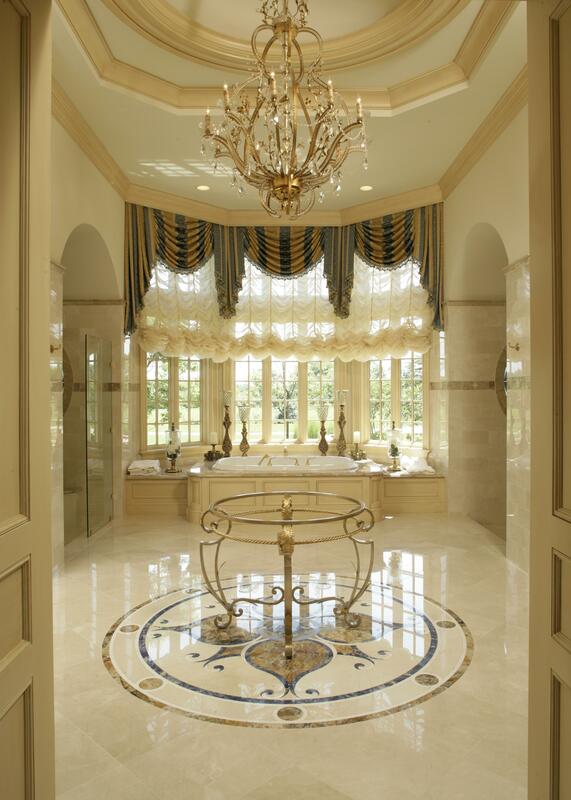 The granite blended with marble, gives a Victorian feel to the floor. The Saturnia marble mixed with travertine, limestone, Amtico Florentine blue marble gives the floor an Italian or Greek impression. Finally, the wood design could be considered a mosaic as it is a design made of other types of woods inlayed. In return, these wood floors a traditional or colonial foundation to the room. 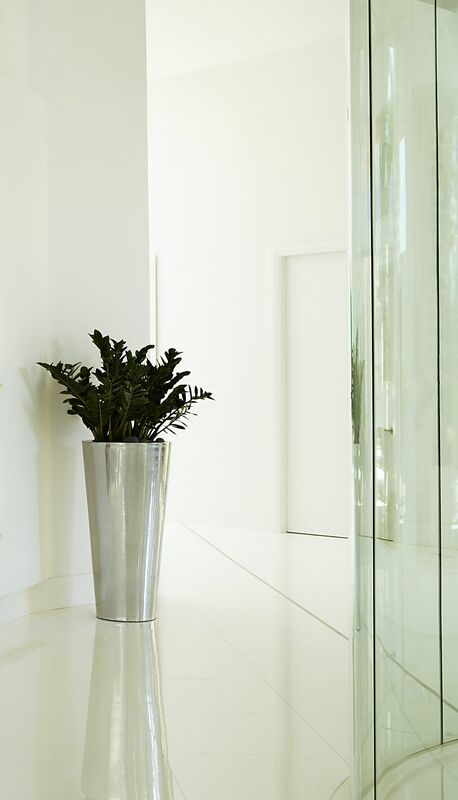 Overall, floors can be as simple and basic or as elaborate and detailed as you style. 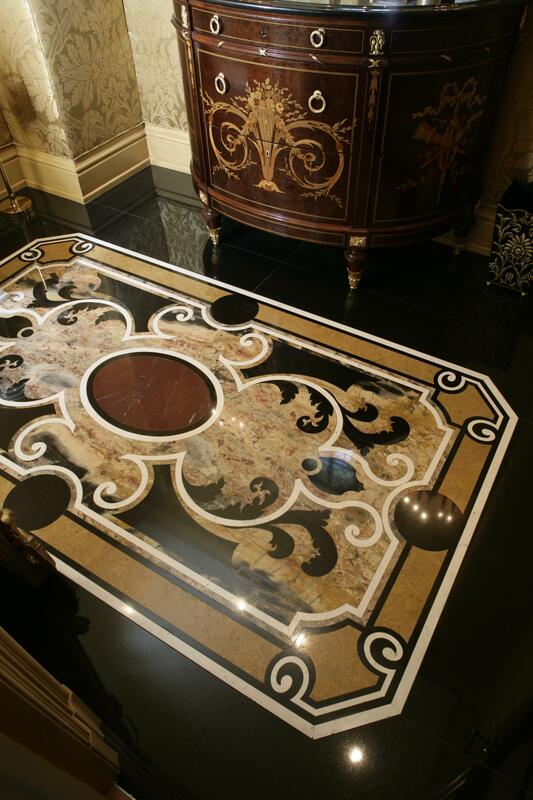 Design just doesn’t rest around or on the floors…it starts with the floor! Purple is a combination of two primary colors on the color wheel: blue and red. This is unique because the two colors actually are opposites yet when mixed they blend into a beautiful radiant color that is actually considered artificial in nature, as it is very rare. Only a few flowers contain the color purple naturally. The association to this color falls under the categories of: royalty, wisdom, mystery, magic, creativity, dignity, and independence. This spiritual color symbolizes: power, nobility, luxury, ambition, and conveys wealth. There’s no doubt this color is a powerful blend. Purple uses the cooling attributes of blue and the energy of red to make itself a color that is always noticed. When worn, purple stands out the most compared to other colors, again, this could be related back to the fact that it was considered artificial. Throughout history, nobles of the past and the wealthy wore purple robes and or clothed themselves and their beds with purple. Origination of the word to describe this color came from Tyrian purple or sometimes known as imperial purple. Which was derived from mollusc , an animal with no backbone and a shell that lived on the coast of Tyre located in ancient Phoenicia we know this as Lebanon today. Did you know that there is actually a phobia that purple is associated with? There is, it is called porphyrophobia. This is a fear of the color purple. Purple brings fashion to the bedroom with this fabulous room. The fashion silhouette dances on the walls in a purple toned dress kicking up her heels. 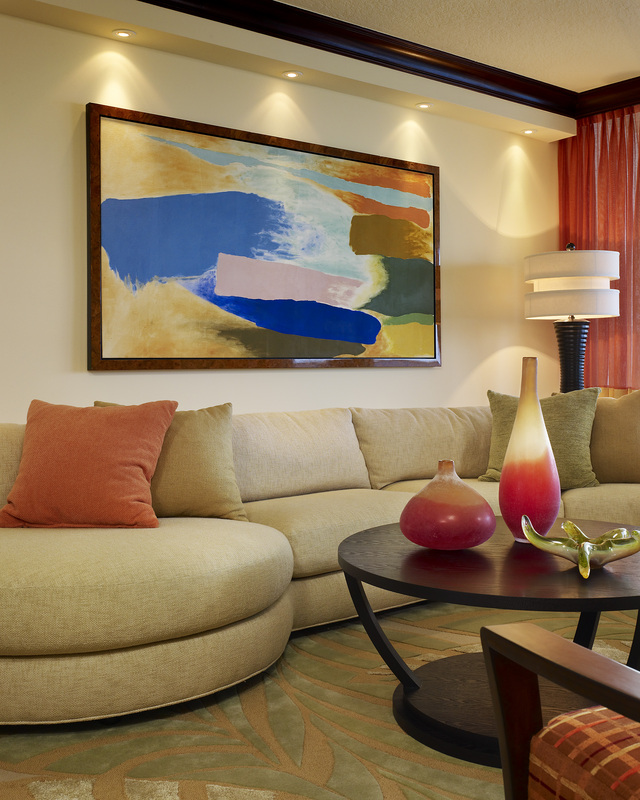 The espresso brown background of the painting ties together the décor of the room. This bedroom brings purple to all different hues accented with darker browns. The plum suede walls behind the bed set the perfect backdrop for the lighter grey toned purple bed. The faux mink throw blanket adds to the fashion and wild side. Looking at the window drapes you can clearly see the illusion that the white stripe brings. Changing it up the purple doesn’t stop here; this tailoring bathroom has modern sophistication that does the jive. The purple glass bowl stands on the vanity under the faucet. Shelves built into the bath tub storage for towels and more. Tiles of rich purple line the walls of the shower; a glass door opens the room and reflects the light. The fan that hangs is a smart touch, eliminating humidity and heat after the shower. Fashion incorporated in design paints this purple picture. 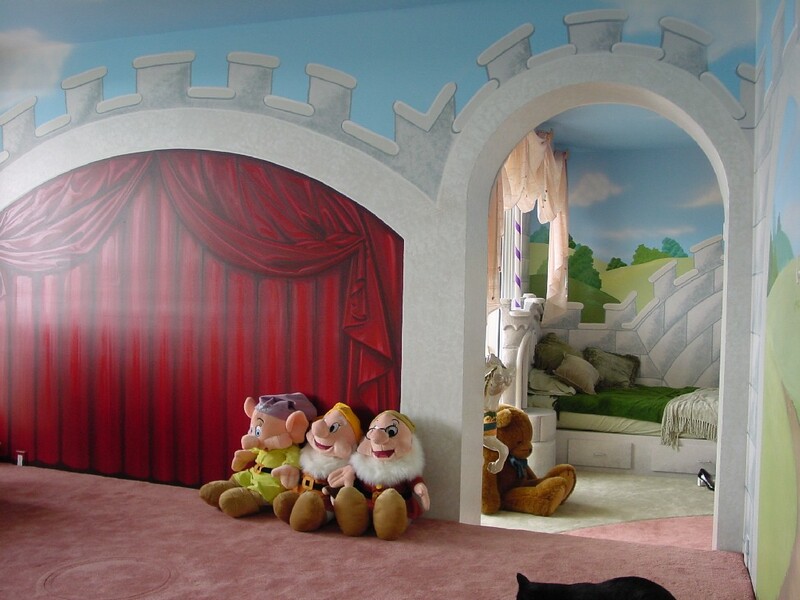 No need to go to Disney, it’s been brought to you through this adorable room. Bring fairytale’s to life with this Castle fit for two Princesses. 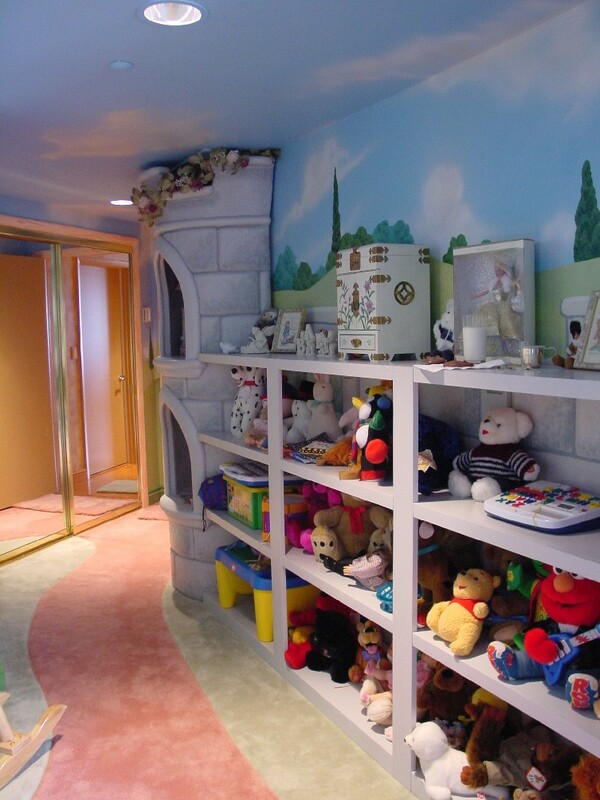 Follow the pink carpet through the passage way in the suite, greeted by Disney’s classic characters. 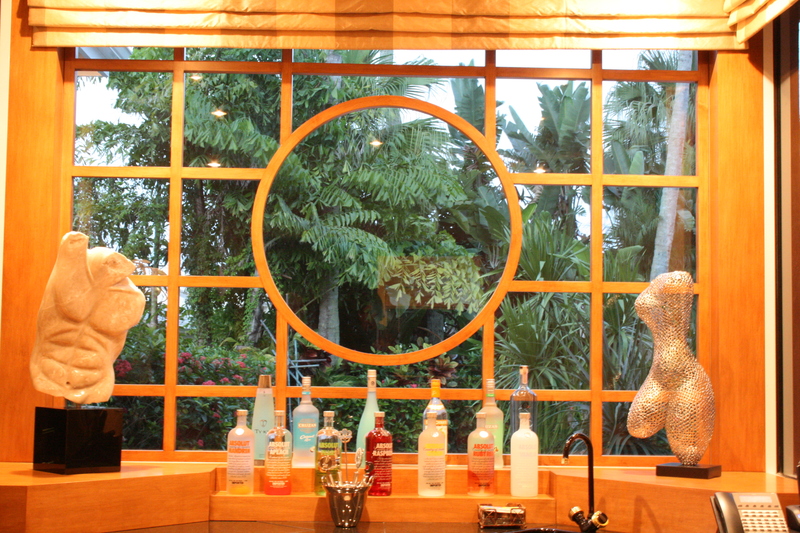 A suite full of enchantment delivers sweetness at every corner. Designed with castles in mind, contains archways and everything divine. The dolls stand in the tower on display. 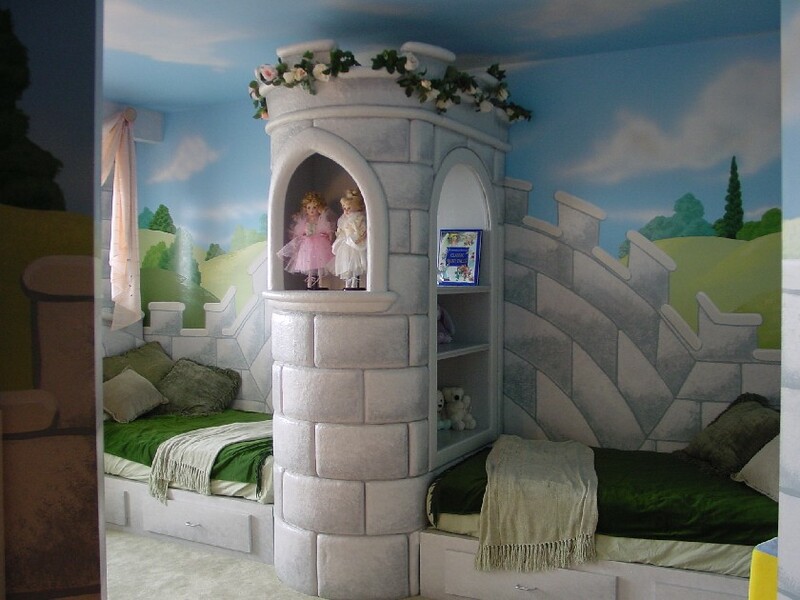 Each little princess has their chamber to sleep and play. The arches separate the suite from the stage. Bookcases house the stuffed animals for easy access; storing each of them gracefully and out-of-the-way. Around the bend and bow is the fantasy of play. A raised platform with stationery paneling curtains gives the illusion of a real life stage. Perfect for make-believe, presented with expression. Drawers under the platform are storage for props. Sitting with applause are some friends The Seven Dwarfs. The ‘wishing well’ painted on the wall, brings wishes to life. Sheer and soft valance swags over the window lets in the sunlight. This suite serves all the elements that are important for children: security, imagination, play, learning, sleep, and self-expression. 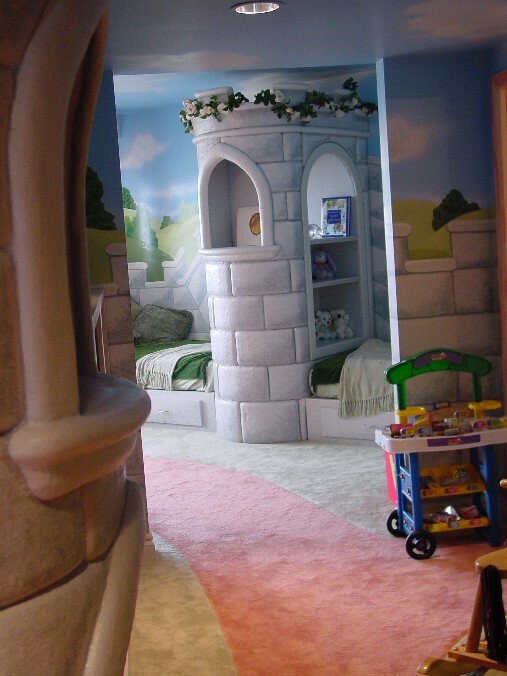 Children often associate their room as “THEIR” room. Simply put, it is the one place that is in their minds… theirs. It is the first place in which the child develops identity with security. Attention to the child’s interests assists in the development of the child’s emotional state. 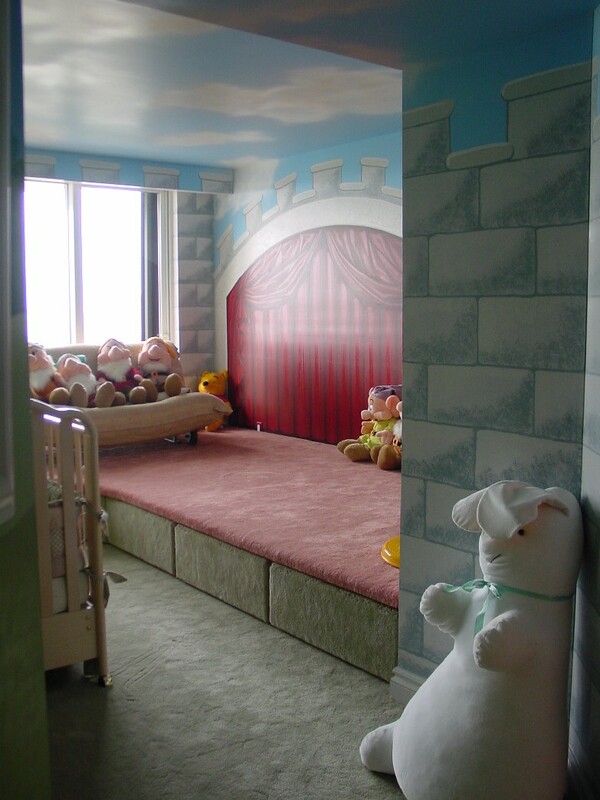 Themes as a style of décor, engages the child’s creativity and security, as they can relate to what’s around them. This allows them to be themselves and discover who they are. The fairytale suite, cute, sweet, and everything adorable is made for two. 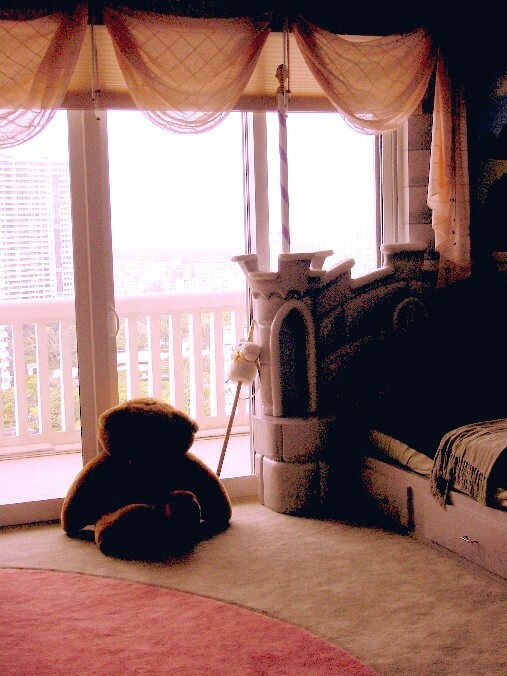 Castle of dreams for little girls do come true! “I think there is a world market for maybe five computers.” – Thomas Watson, chairman of IBM, 1943. Much has changed since 1943 when Watson made his comment regarding computers. Today, sixty-eight years later, each home may be in the market for five computers at one time. Ken Olson’s comment in 1977 regarding having the computers in the home has changed a lot, as each home has at least one computer. The home office has become a room of standard however with the innovations and improvements of portable technology, this room quickly blossomed twenty-five years ago, fast forward, the usage of it has altered. Once a room that shelved itself with your collection of books, where personal files were kept, where mail was opened, and days were planned. This room currently has become more of a space for play for adults today as well as the place of business. E-books fill our E-readers, files can now be scanned and saved on the computer in a way that it can be accessed from wherever, and most mail that used to come in the mail is now sent to your email. Although, much has changed, this room has become a huge trend. The home based business or home office wasn’t as popular in years prior, currently it is a trend that is growing fast. Granted many factors come into play. A survey from the IFDA (The International Furnishings and Design Association) members says that 40% of homes will have more than one “home office”. So what is this space in our homes really used for? Social media has become a prominent influence in our lives. It has opened a new way of communication, allowing an individual to find old friends, new friends, businesses, etc, yet it has also enabled a new style of confidence to the person who may have been shy before. Home offices have also become our home store, through online shopping. The décor of the office is always interesting. The home office seems to motivate and gives the feeling of importance, giving the owner the “power” to be or show success. 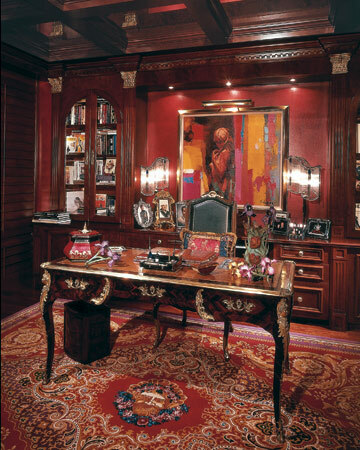 Notice in these home offices the detail in the built-in’s, the design of the desks, the materials that surrounds, and the colors chosen. Each one of these are different; yet give the same answer, successful. A strong statement speaks the desk. 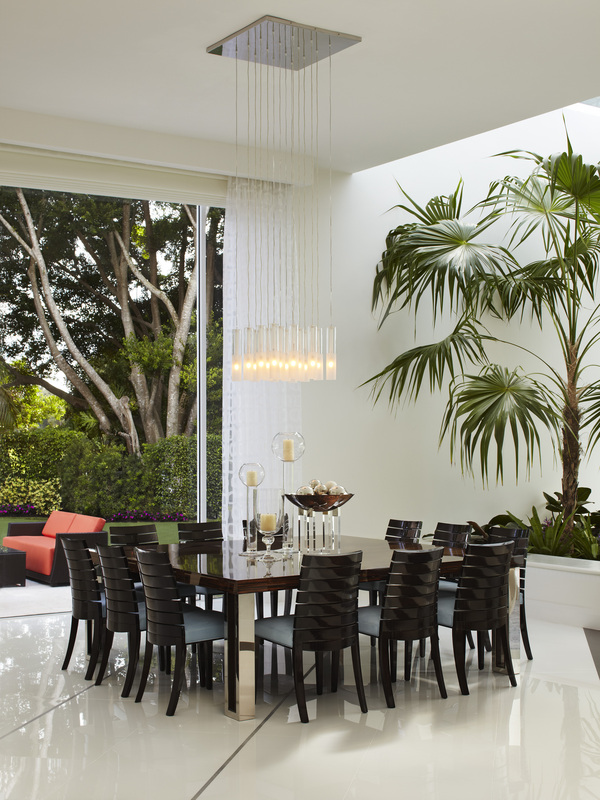 A room set around the table sets the scenery for the “dining room”. 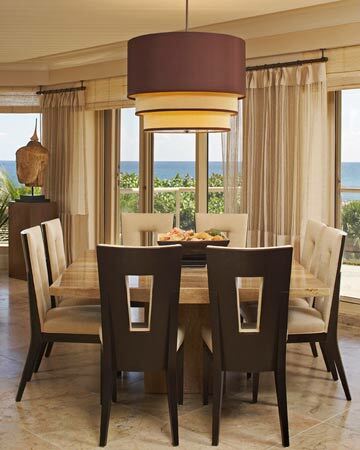 The room that centers around gathering around the table serves: conversation, entertainment, and food. 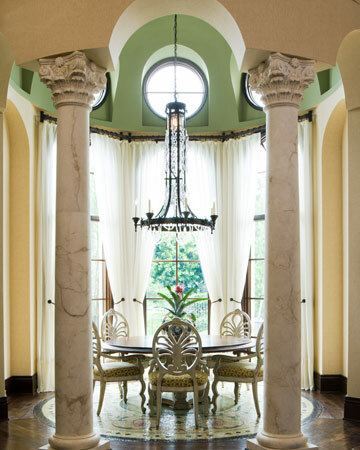 The usage of the dining room has been a staple in gathering in meals. Etiquette of dining has a large range from causal to formal. 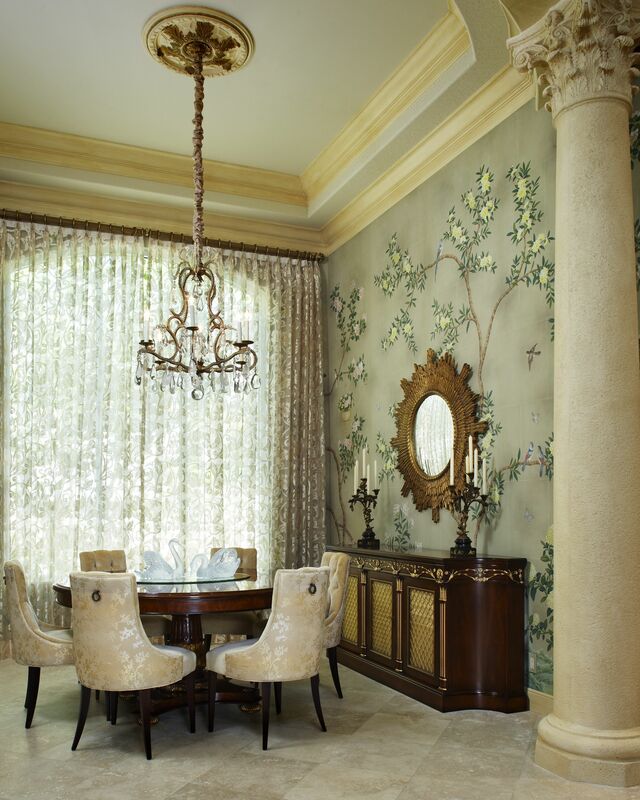 The table and room themselves involves an infinite design creations partnered with temperament. The experience when dressing the room is shared from children to adults. Lessons begin at the table, teaching; responsibility, communication through discussion, manners, and more. Tables, a basic in furniture, can be dated back to a minimum of 7th Century BCE. Simple in design, composing of a flat surface resting on les, pillars, and/or trestles. The original tables were made of metal, stone, glass or wood. 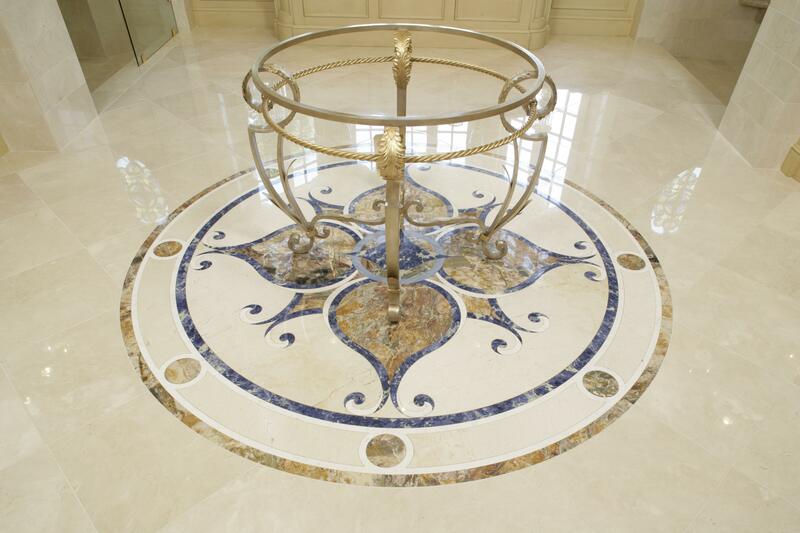 Ancient civilizations have been noted to have used marble. It wasn’t until the 20th Century that crystal, plastic, and other different types of materials would be produced. The word table was derived from the Latin word “tabula” which translated means: board, plank or a flat piece. The earliest types of tables were made to be transported, having the legs or trestles able to be removed for transit by horse. History shows that the gathering around the table or eating together at the table came into being in the Medieval period. Each period in time was marked by the different alterations that the actual design of the table would contain. For example the “Elizabethan Age” was known for the rounded legs. In 1155 Wace was the first to describe the table. From there the symbolism, meaning, and legend of the table started to develop. The psychological aspect, also have played a huge part in time with King Authur’s Round Table. The shapes of tables began as squares or rectangles. However, we see in the legend of the Round Table the purpose of the circle. The gift from King Authur’s father-in-law, this table was the first to show equality at the table. Round in shape this table announced that all whom sit, interact, or participate there are of equal status, making it a clear statement of the chivalry that increased under Authur. Dining rooms were placed on completely different floors from the kitchens back in the day. A lot has changed over the years. Now most homes have the dining room within steps of the kitchen. The table-cloth came introduced itself to the dining room in the Victorian Era. The purpose was because it was considered to be in bad taste to show the legs of the table just like it was in poor taste for a woman to show any part of her legs. Early tables used to be described as having a masculine design attribute. This could be due to the influence that men had on the basic furniture. After meals, women would excuse themselves to go to the drawing-room while men stayed at the dining table for after dinner drinks. Our social behavioral habits have changed much from the century’s prior. Many times our meals are eaten at the counter tops or in front of the TVs in our family rooms. 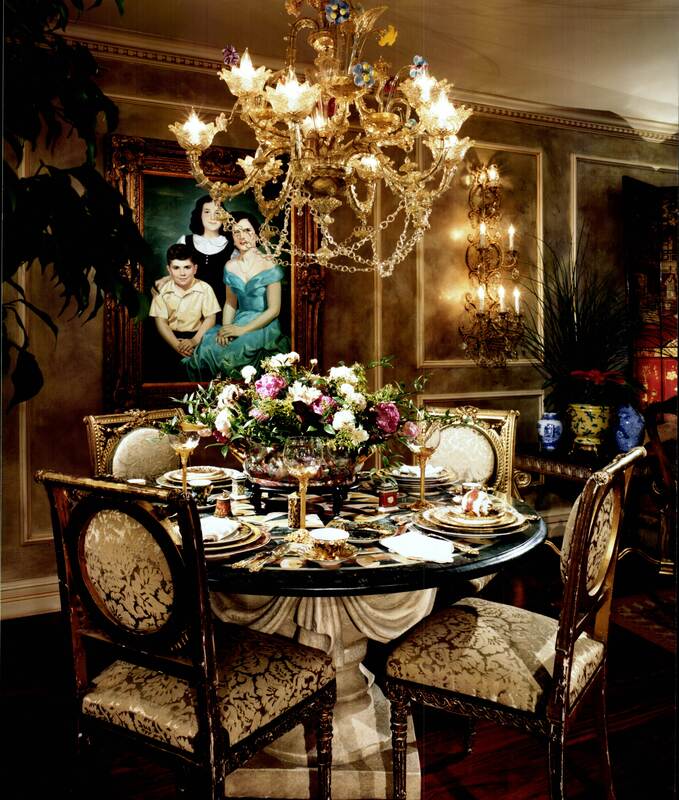 However, when it comes to holidays the dining room houses the family table. 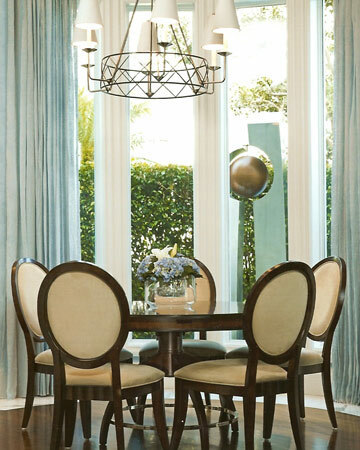 Dining rooms can feed; breakfast, brunch, lunch, dinner, and supper, etc. Whatever meal it is, this room still attracts all whom dwell in it to sit down together and share. There is so much that can make this room a feast for the eyes. Dishes, silverware, glasses, chairs, walls, candles, flowers, etc so much to consider when choosing the décor. Today, the dining room has evolved into the breakfast room which is a smaller place for meals for immediate family. The breakfast table or room is an intimate setting that brings us closer together, filling the gap between years. The rewards of the table are trophies for our families. The table becomes the place where parents can engage children in speaking about their day or what happens to be on their young minds, resulting in better relationships. The table supports our society, in all fields. 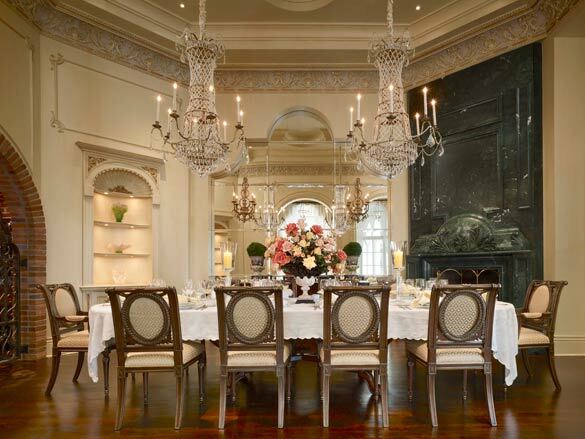 The statement piece that stands on its own, basic as it may be, is significant in the dining room. The expression “sleep tight” comes from the 16th and 17th centuries when mattresses were placed on top of ropes that needed regular tightening. 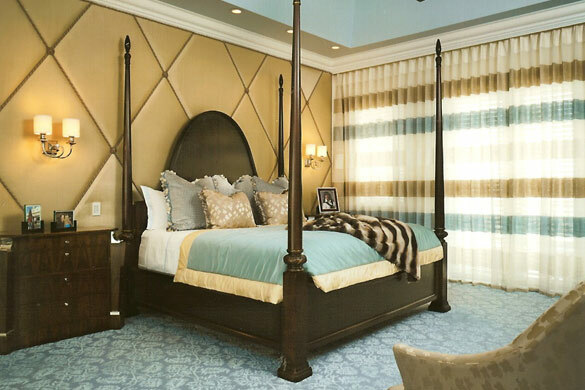 The design aspect and process of the “Master Bedroom” especially has evolved over the years. Originally designed by the female and/or wife, has become more of a joint effort including the male/husband. 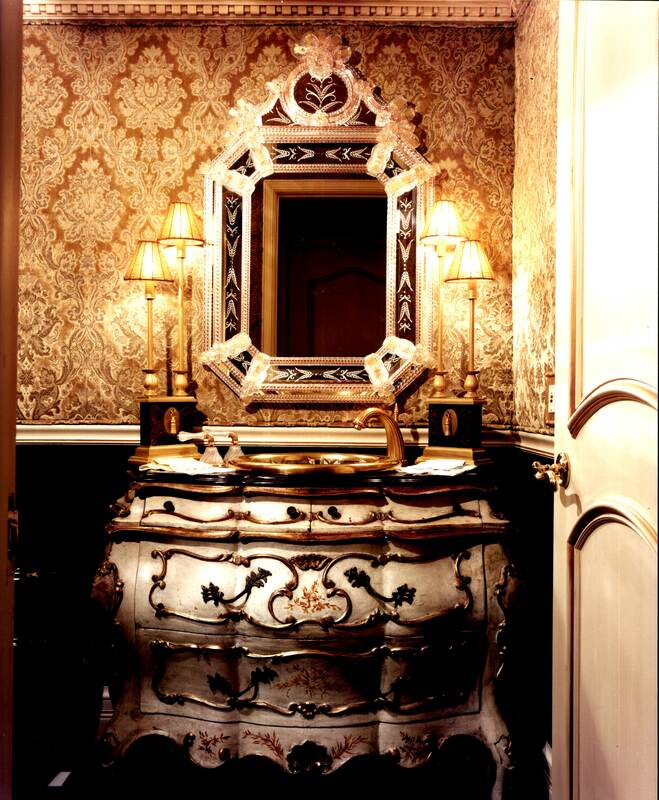 The room reflects both masculine and feminine attributes. Even though, this is a sure accomplishment in one area of balance, there are two other areas in the bedroom that have become a source of the tipping scale. Innovative technology, although convenient have entered the bedroom resulting in sleep deprivation and distraction. It turns out, because we rely so heavily on the technology, we have made it the biggest part of our lives; resisting the time to turn them off. Instead we continue to check emails, write emails, send texts, etc. The issue seriously becoming aware as to when to turn off. By not turning off our TV’s, cell phones, computers, etc it has translated to our brains resulting in the inability to completely turn off and rest. The romance aura in the bedroom has so often been lost in translation resulting in couples either no longer having any physical contact or worse in separate beds. Research studies have shown that couples that have some sort of physical contact through touch actually have a happier life overall, as it is our “need” as humans to feel, touch, in order to express love, receive love, and support our emotional beings. The importance of décor in the bedroom plays a big part visually. The design: an enhancer of a multitude of areas. Factors everything from the positioning, lighting, functionality, balance distributed by furniture, colors, fabrics, etc that interact with the psychological aspect attached, results setting the mood. 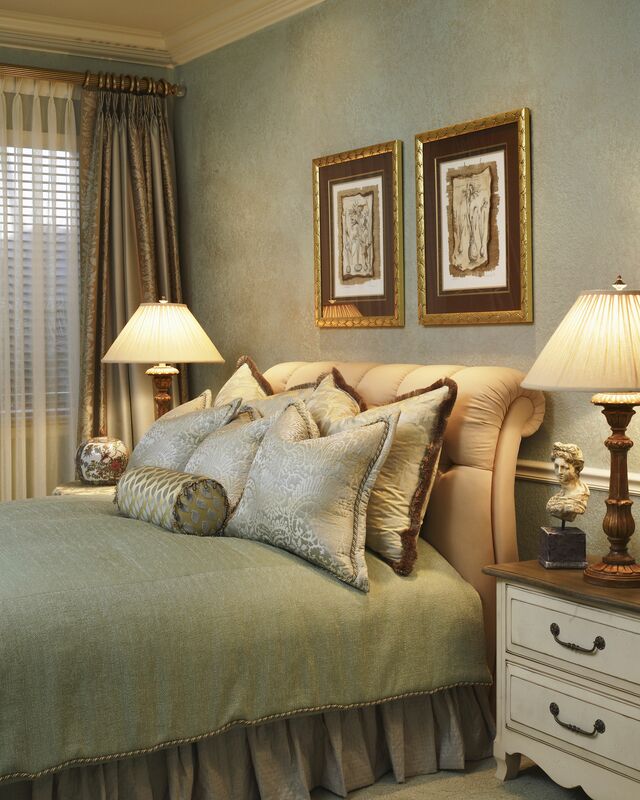 It has been suggested that dim or soft lighting in the bedroom is important in calming the mind. Another relaxation variable is color. Despite what studies, research, and theorist, may say, the color of relaxation really is in the body of the individual. It is believed supple pastels or cooling colors are ones to use in decorating the bedroom; however, everyone’s programmed, conditioned differently, overall it is a personal preference. In the beginning, history time line: The “bed” actually dates back to the Neolithic primitive era which is over 10,000 years ago. Most, when asked would date the bed back to the Egyptians, as they were the first to encumber design detail on the bed frame with jewels, and rare metals in the outer banks of the beds. The official decoration of the “bedroom” started with the Ancient Assyrians, Medes and Persians. Famous for its prestige the ‘four poster’ developed in England around the 18th Century. Today, we use one bed for either one or two people, however back in the day one single bed would sleep several people as they were grand in size. The bedroom serves as a room of many functions for our everyday lives. From the layout to the mattress this room spares no expense. Time has value as we spend about eight hours of our twenty-four hour day in this part of our home. The importance of sleep displays itself through the mattress. The spring coiled mattress was introduced in the 1820’s. Today, we have improved on this invention to the bed with: innerspring, latex, memory foam, air bed, water beds, adjustable and dual purpose beds. There are many different subtypes within the types above, there’s firm, soft, pillow top, etc. 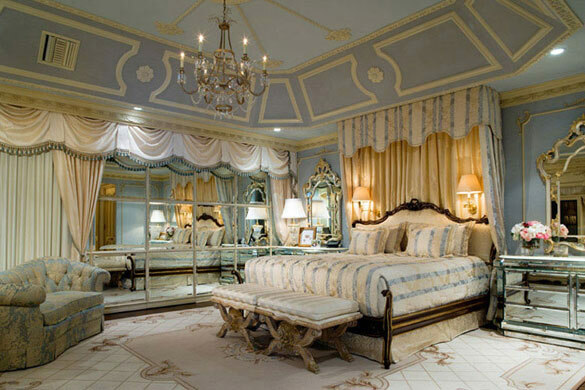 The way we use our bedrooms begins with the architect whom designs the layout of this popular room. The flow and space usage is a key from the position of where the bed is placed, the location of the bathroom and its access, the closet, as well as the size, shape, placement of the windows. The bedroom also can play many different personalities to our lives. As kids, it can be the place of punishment unfortunately at times. However, it can also be a place of imagination, and comfort. As adults it’s the place where one goes to find peace, quiet, and alone time. When away from home, we realize that there’s really no place like home, and we miss our beds; a whole new appreciation for what we have, our preference of comfort. The sanctuary of our dreams we also make the bedroom our temple, church, and/or place of worship when we say our prayers each night. This room can also be related to the core and beginning of our homes as it is also the potential place in which we procreate. The bedroom is a place of beauty for sleep. Enter your email address to follow "Eyes for Designs" and receive notifications of new "Sneak Peeks" by email. "Eyes and Designs" Sign up! © Sabrina Alexis and "Eyes For Designs", 2011-2014. Unauthorized use and/or duplication of this material without express and written permission from this blog’s author and/or owner is strictly prohibited. Excerpts and links may be used, provided that full and clear credit is given to Sabrina Alexis and or, Susan Lachance and "Eyes For Design" with appropriate and specific direction to the original content.